There’s still so much information to share about what I was working on at both the second day of the Kirsten Lundberg printing workshop during Felt in Focus and at the book launch party with Chrissie last weekend but I’ve finally realised I am never going to have enough time to write everything down here on the blog!!! It’s difficult to be brief but if I’m not I am never going to be able to update you all with the most important info and in turn I’m never going to be able to actually have my planned ‘staycation’, more about that next post! So, here is a synopsis of the techniques I sampled during day 2 of Kirsten’s amazing workshop ….. The use of different binders on silk and cotton with the intention of creating a resist through which fibres would not migrate when working on nuno felt. These binders could be white, transparent or opalescent and all could have pigments added to change the colour. They could be applied in a variety of ways such as rollers, screen printing or painted directly on the fabric. The use of a ‘glue’ to add text and images from magazines. The use of a ‘glue’ to add metallic foil. We discussed rust dying and had a look at various samples. My main focus over the course of the 2 days was to print two similar but slightly different pieces of fabric basing my design on the dry stone walls surrounding me here at Clasheen. I will be blogging about this further because in a couple of weeks I am going to be combining these with a variety of different coloured wool to see how best to replicate the texture and effect of the walls as I imagine them in my head, I’ll keep you posted. Now, on to the party. A big thanks to …..
Everybody who attended and helped make the day so special for Chrissie and me and added to the wonderful Irish style party atmosphere! All who so generously brought gifts of salad, flowers, wine, soft drinks, yummy deserts and all thoses yummy extras that went to make the buffet table so tasty, you know who you are!!! Nigel and Alan who carted tables, road signs and all the hardware kind of stuff around both before and after the party. Those essentialtal washer upers including Elizabeth Cope, Suzanne, Shaz and Nigel. Chrissie and Nigel for being such fun, isn’t the power of the internet amazing??? Good friend Martin Lyttle who introduced me and Chrissie for us to officially launch the book. All those of you who bought the book and those of you who now have to order online because we sold out, thanks! Chrissie and me revealing the front and the rear of our ewe! 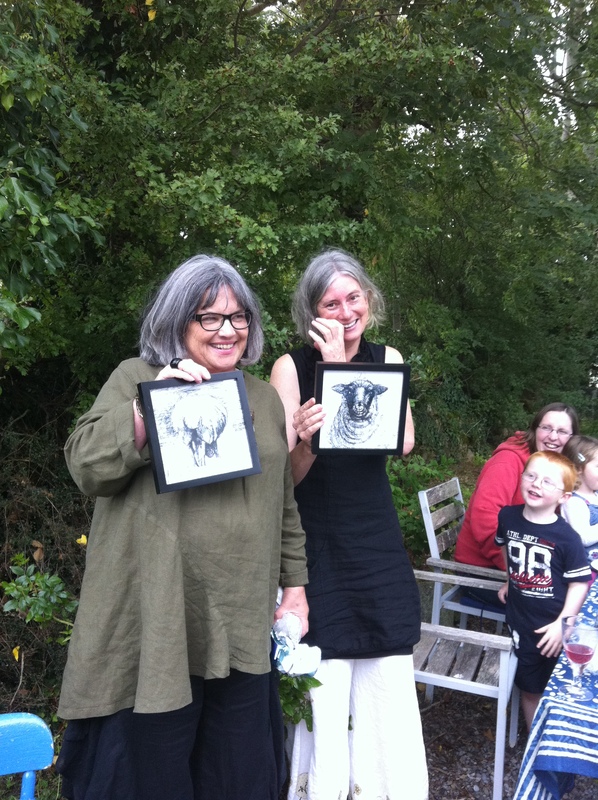 After we both spoke a few words Chrissie presented me with the choice of two identically wrapped parcels, here is a picture of us as we revealed what each one contained, my parcel contained the front end of a sheep and Chrissie’s the rear!!! Thanks Chrissie for such a well thought out gift, each picture means something by itself but together they make a whole. As a result of hearing our story about meeting through the internet Sue Nunn kindly invited us both to join her for a slot on ‘The Sue Nunn Show’ before Chrissie and Nigel travelled home on Monday morning. Thanks Sue for the invitation and allowing us the opportunity to chat and speak about our love of felting, we had a great time!!! During the course of the programme we discovered that Sue and KCLR are participating in ‘the innocent big knit’, a movement to help keep older people warm in Ireland this winter. We know that felting isn’t knitting but since crochet hats are accepted too Chrissie and I thought we would put the word out there that we are both felting hats to give to Sue, would anyone like to join us in supporting this worthwhile cause??? If you do decide to help out we need the hats to be with Sue before the end of the first week in October. I am going to suggest that anyone who wishes to participate felt your hat/hats, post them to me (Nicola Brown, Clasheen, Ballybrack, Borris, Co. Carlow, IRELAND) to arrive no later than the last week in September, I will blog about them and take photos then deliver them in person to Sue before the final date. Do please let me know if you are participating then I can keep an eye open in my post box!!! Thanks! This entry was posted in Book, Book with Chrissie, Felt, Felt in Focus, printing, workshops and tagged Felt, Felt in Focus, Felting, from felt to friendship, innocent big knit, Kirsten Lundberg, printing, Sue Nunn by Nicola. Bookmark the permalink. Wow! You two squeezed an awful lot of fun into your time together…So wish that I could have been there with you both…Sounds like such a wonderful time. Chrissie’s gift was perfect!!!! Great picture of you both…So happy . Life is good!!! Kirsten’s workshop must have been amazing. Can’t wait to see your upcoming stone wall pieces. I’ll post a hat over to you…Very worthwhile cause. Will try to pop in the mail ASAP.